Is the Normandy a reality or just a big tease? Despite Nokia's device and services division now being owned by Microsoft, Nokia's Android handset, the 'Normandy' as it's currently known, just won't go away. 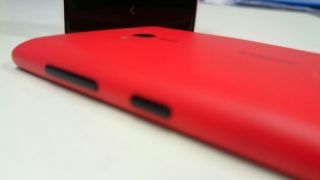 The picture looks a lot like some earlier images we've seen of the phone, though in fairness it could just as easily be a new Lumia, with its bright red, curved plastic shell. This comes just days after getting a glimpse of the Normandy's screen, complete with what could be a modified version of Android 4.4. It seems a little odd for Nokia to still be working on the phone now that it's owned by Microsoft, yet far from dying the rumour just keeps on growing and an Android phone could help the Finnish firm snaffle some more market share. If somehow the Normandy does make it into shops it might not be something to get too excited about though, as rather than going toe to toe with the likes of the Samsung Galaxy S4 it's thought to be a rather low end handset with a 5MP camera and 854 x 540 display.